While I was in Indonesia, it was pretty popular with sate bekicot (snail satay or sate) or keripik bekicot (snail’s crackers). I was tempted to play around with my rosemary and added into my escargot a. k. a snail. 2. Rinse escargot in a colander in order to remove any sand and set aside. 3. Combine all ingredients, except cheese. 4. 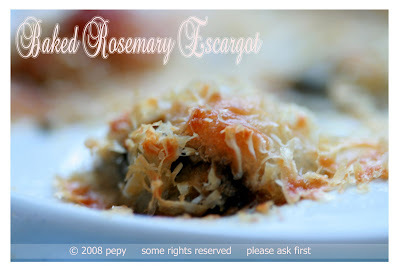 Place escargot mixture on escargot baking dishes. Bake for 12 – 15 minutes. OMG, you are killing me…escargot…I love them. I was searching hi and low for them when I was in Cannes, but all the restaurants I went didn’t have that dish. I was puzzled because I was in France!!! I just saw Escargot cooking in a M'sian TV show. It said the Escargot shell is more expensive than the meat!Yours look lovely! I just saw Escargot cooking in a M’sian TV show. It said the Escargot shell is more expensive than the meat!